Should rear spindle/wheel spin freely? There seems to be quite a bit of drag in neutral with the wheel in the air. Should it freely spin or does it rapidly slow down after spinning? Nothing is hitting or abrading. Maybe I need to change the type of grease on the bearings? I'm using normal axle bearing grease. Hawk with many differently shaped fuel tanks. Same even with chain not connected. Disassemble clean and inspect bearings, and replace if nessacery, grease and reassemble, would be my suggestion. Make sure the brakes aren't dragging too. typical axle grease or white lithium? We use regular grease.. with no grease the bearing should still spin pretty free. Not a grease thing. They are sealed bearings. If you feel something may be wrong then it is. With chain and everything on we usualy get a couple rotations with a good solid spin. Just was looking at an fz1 with bad bearings. They tighnered and stopped the wheel spinning very quick. Dust caps had melted and came off.. where looslt hanging on the axle. The dude let it go so long he couldn't even get the axle out. Don't let it go too far. Turn the inner races of the ball bearings with your finger. The bearing should turn smoothly and quietly. Also check that the bearing outer races fits tightly in the eccentric bearing carrier. 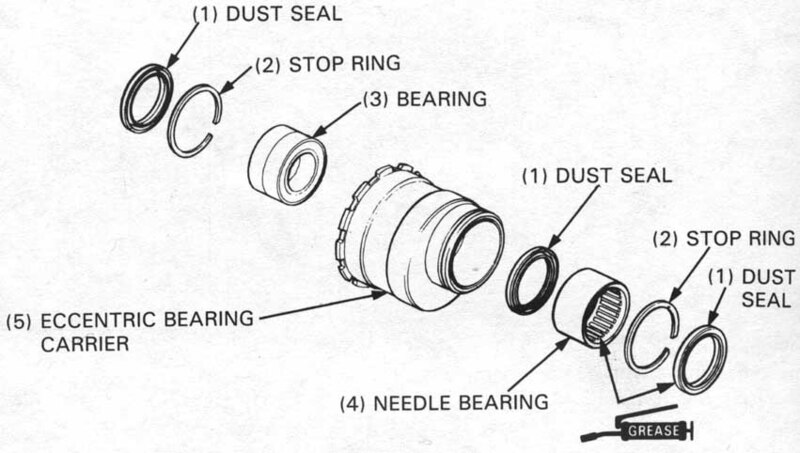 Check the right bearing needle rollers for obvious signs of wear. Remove and discard the ball bearings if they do not turn smoothly, quietly, or if they fit loosely in the eccentric bearing carrier (page 13-9). Replace the bearings in pairs. Replace the needle bearing if it is damaged. 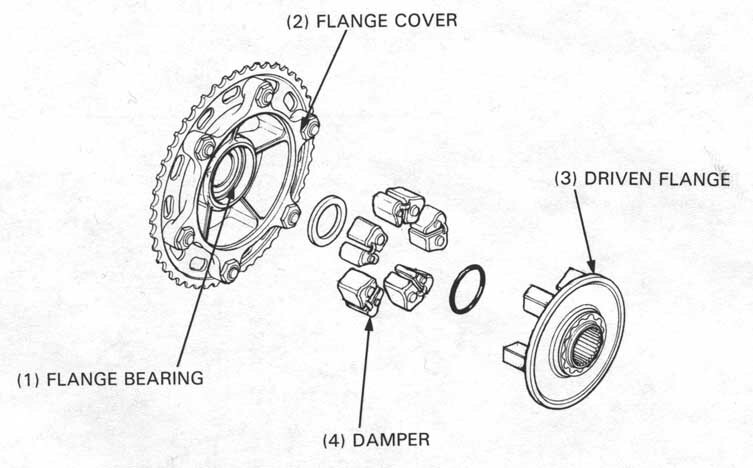 Separate the driven flange cover with the sprocket from the flange. Check the driven flange damper for damage. Replace the dampers if necessary. And... Spa. Always comes through. I think I'm missing the right side dust seal, but I'll go in there and grease it up. If I give it a good spin it free-wheels about one turn only. If you're missing the dust seal, that might explain a lot. Post video if your truly unsure. How many revolutions can you get from a spin? You should be able to get at minimum 1-2. Follow the manual and make sure all the parts are there. All rear wheels experience some friction/drag on account of brakes, chain, etc.